Kariya (Japan) 16th January 2013 – Toyota Boshoku Corporation has started production of motor core*1 components in Japan for the hybrid system of the new Toyota Crown model that was announced in December 2012. This marks the first time for Toyota Boshoku to produce hybrid related components and with optimistic expectations launches its entry into the continually expanding hybrid market. 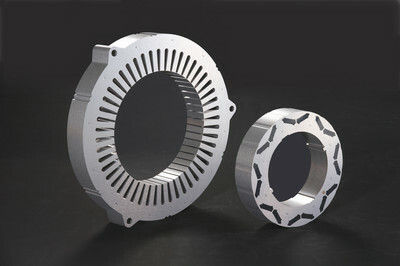 Toyota Boshoku produces key motor core components, specifically the rotor and stator, which are formed by blanking and stacking highly electromagnetic steel sheets. The production method utilizes a precision stamping process*2, which makes the most of techniques from the fine hold stamping process that Toyota Boshoku developed to realize a high precision, high-speed press for mass production. Additionally, stacking processes that take into consideration the characteristics of steel when it is stamped were successfully implemented achieving highly precise and high-speed production of components for automotive motors. Furthermore, for the production method Toyota Boshoku created an integrated production system that covers all aspects from the press stage to final inspection. To further strengthen its production technology, Toyota Boshoku proactively continues to improve its precision stamping process techniques. Together with implementing high precision machine tools, Toyota Boshoku also undertakes skill training and various measures to strengthen its organization. With the launch of this production, Toyota Boshoku also developed and manufactured the stamping dies it uses to produce the motor core. Here on out Toyota Boshoku aims to expand production of key powertrain components that generate automotive power in addition to maintaining its business of supplementary engine parts. *2: A process which stamps and layers sheets until a certain point when the press automatically finalizes the process resulting in a built-in component.